—27% of registered voters who own a cell phone have used their phone in this election campaign to keep up with news related to the election itself or to political issues in general. 35% have used their smartphone during this election campaign to look up whether something they just heard about a candidate or the campaign in general was true or not. At the moment, cell phone apps are playing a relatively minor role in connecting voters to candidates, parties, or interest groups. Some 45% of cell-owning registered voters use cell phone apps, but just 8% of these apps users have used apps from a candidate, political party, or interest group to get information or updates about the campaign during this election season. Cell phones are being used by a wide range of voters in this year’s election cycle. When it comes to general ownership and usage, registered voters who identify as Democrats and Republicans are equally likely to own a cell phone, to own a smartphone, and to use text messaging or apps. Liberals are a bit more likely than conservatives to own a smartphone or to use text messaging, but cell phone ownership in general is consistent across the ideological spectrum. Looking specifically at how potential voters are using their phones for political information and engagement, Republicans and Democrats engage at comparable levels in all of the mobile-politics activities we measured in our survey. There are some differences on this issue related to political ideology—for example, liberals are more likely than conservatives to use their phone to get political news—but overall these variations tend to be fairly modest. These findings are based on a nationally representative phone survey of 1,005 adults (ages 18+) conducted September 20-23, 2012. Interviews were conducted in English on landline and cell phones. The sample contained 872 cell phone owners, 731 of whom are registered voters, who were asked questions about using their cell phone for political activities during the 2012 election campaign. The margin of error for the full sample is ± 3.7 percentage points. 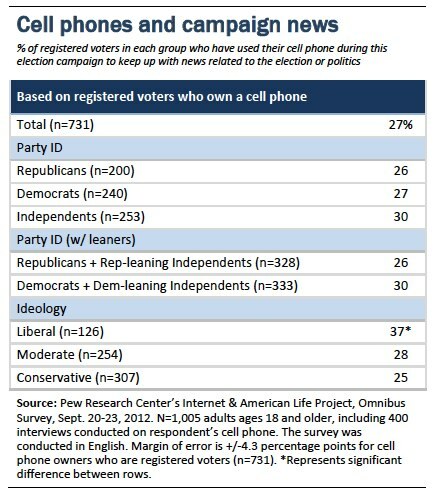 The margin of error for cell phone owners who are registered to vote is ±4.3 percentage points. The material that follows in this report illustrates how voters of various political and ideological stripes are utilizing their cell phones during the 2012 election campaign. Unless otherwise noted, all findings are based on registered voters. 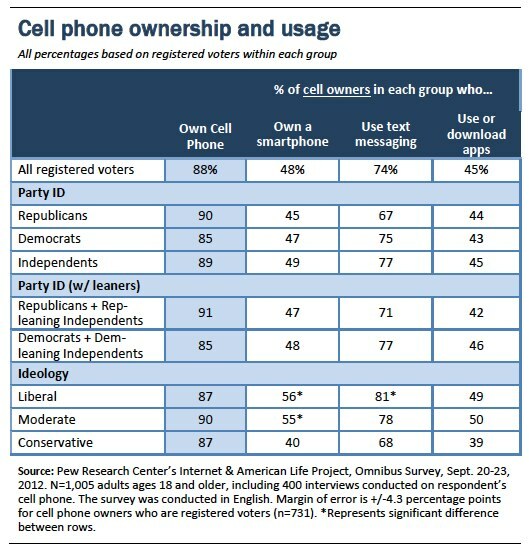 There are few differences in overall cell phone ownership and usage related to political affiliation or ideology. Democratic, Republican, and Independent voters are all equally likely to own a cell phone, to own a smartphone, to use text messaging, and to use or download apps. However, liberal voters are more likely than conservatives to own a smartphone or to use text messaging (although liberals and conservatives are equally likely to own a cell phone of any kind). Some 27% of registered voters who own a cell phone have used their phone during this election campaign to keep up with news or information related to the election or politics. There are no significant differences on this question related to party affiliation, although registered voters who identify as politically liberal are a bit more likely than conservatives to use their phone for this purpose. In terms of demographic differences, cell owners ages 18–49 are more likely to use their phone to get campaign news than those ages 50 or older, and those who have attended college are more likely to do so than those with lower levels of education. 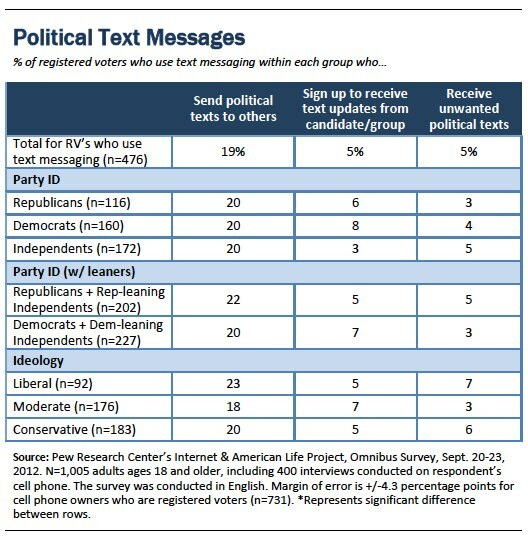 Among registered voters who use text messaging, 19% have sent text messages related to the campaign to friends, family members, or other people that they know and 5% have signed up to receive text messages directly from a candidate or other group involved in the election. Text messaging users of all political stripes are equally likely to take part in these activities. In addition, some 5% of these text messaging users say that during this campaign they have received unwanted election-related text messages that they did not sign up to receive. For the most part, these unwanted messages are a relatively infrequent occurrence—1% of these voters say that they receive these messages “every few days,” and 1% receive them “once a week,” while 3% receive them less frequently than that. The relatively small number of Republican and liberal smartphone owners in our survey means we are unable to perform a detailed analysis of these groups—although outside of those two groups there are no major differences between smartphone owners pertaining to party identification or political ideology. However, there are some key differences on this issue relating to age. Compared with those over the age of 50, smartphone owners ages 18–49 are significantly more likely to use their smartphone to read other people’s political comments on a social networking site (52% vs. 30%), to post their own comments on a social networking site (22% vs. 12%) and to use their phone to look up further information about political statements they have heard (43% vs. 19%).